I considered it a veritable achievement that I awoke before the deferent knock at my door, but my habit of appearing late to breakfast continued, owing to some unsuccessful struggles to upload photos to my blog. I also discovered that basic Vimeo only lets me upload one HD video a week. My trusty little Canon point-and-shoot is cool enough to shoot in HD (there’s a huge difference between the video I took with my phone at Kakkaiyankulam of the mirror game, and the videos I took with my camera at Chiraddikulam. After dithering a bit, I figured it would be an investment to pay the $60/year fee to upgrade. So now I can upload multiple inane/badly-shot videos of my kids playing games every week! In HD no less! After a breakfast of buns, and learning more Tamil from Mr Kamal, I spent the morning blogging (why does it take so long to write 2000 words?) and quite suddenly it was lunch time. The carnivore in me was at first a little disappointed to discover my lunch was vegetarian, until they brought me a satisfying chunk of fish to accompany it. Maheshwari arrived, and I also took the opportunity to call Major Edirisinghe to remind him that I would be arriving. Mr Kamal is quite good about teaching me Tamil, but in the absence of Mr Kanapathy, punctuality takes a hit. The van supposed to come for me at 1pm arrived at 1.30pm, so when Mr Kamal asked me if I would be back by 7.30pm, I did a bit of a passive-aggressive act and told him it would probably be closer to eight, since we were a little late to begin with. When the van arrived, I found that they’d brought sacks of potatoes in it to the hotel, and for some reason I found that rather funny. After the sacks were cleared out, and Mheshwari requested and received a cap, we set off. I remembered to buy a lunch packet for Nanthar in case he thought he could subsist on Lemon Puff this week also. At Cargills, I bought more than enough biscuits for 20 children, after the rather embarrassing fiasco of the week before. I’m not sure what it was – I think we just drove incredibly fast – but we passed by the turn-off to Kakkaiyankulam in 45 minutes, and reached Chiraddikulam in under two hours. It’s strange, though. On the way, Maheshwari asked me: “Even though we got late, it didn’t make you late, did it?”, to which I decided not to respond in my usual “No, No, that’s all right” voice, since it didn’t sound like a question but a statement and I felt suddenly peeved. So I said simply, “I don’t know yet; if we get there by 3.30pm we won’t be late!” I feel a bit bad about all my passive-agressiveness, but I don’t really want to have to get there late and then feel like I need to leave early each week. I must also note one other thing: I called Major Edirisinghe again to ask him (again) if I could use the school, reminding him that I needed tables and chairs for the children to write and draw, and again he assured me that would be possible. However, I was not surprised when he called again to apologetically inform me that the principal stored his things in the school so it was currently locked. My project is lowest priority to the army, and I don’t take it amiss when they politely acquiesce to accede to all my requests and then promptly forget about them. What I found odd were his next words – he said there was a whiteboard in the community centre, and I could use that. I reminded him again that the reason I’d asked to use the school was that I needed tables and chairs, while marvelling at his remarkable ability not to process information. Personally, I find this inability to register what someone is saying very disturbing – I would have assumed that as a Major, he would find it second nature to be able to listen with half an ear to what someone is saying, yet be able to recall what it was that was actually said. Surely that is an essential skill for army personnel? Maybe, as with my children, I expect too much, and maybe he listens assiduously to everything the Colonel and Brigadier say; I just assumed he would be able to do it unconsciously. Fortunately, I’m learning to be prepared for situations like these (while being grateful when things actually work out, instead of accepting it as a given!) so when he told me that the pre-school tables and chairs were available, I responded cheerfully that those would be fine. The children of Chiraddikulam are quite small, so I figured we’d manage. There were about 20 children assembled at the community centre, and it was with much regret that I had to tell everyone 12 and above that I would eventually be doing a programme for them and that I wouldn’t be able to accommodate them in the workshop meant for the 9 to 11-year-olds. I’ve thought about it a lot this week, and I figure that in the end it would be a good thing – otherwise I’ll have no one from Chiraddikulam when I do the next iteration of the workshops! It didn’t make it any easier, though, and there was a lot of reassurance that they’d get a chance too, and of taking down names. After these rather lengthy proceedings, I collected last week’s essays (they’re better at doing homework than the kids at Kakkaiyankulam, it seems? And they brought back the pencils!) and after taking down names, I found I had 12 kids, which I thought was an excellent number. We started off with the usual name games/ball games and then moved inside to continue. 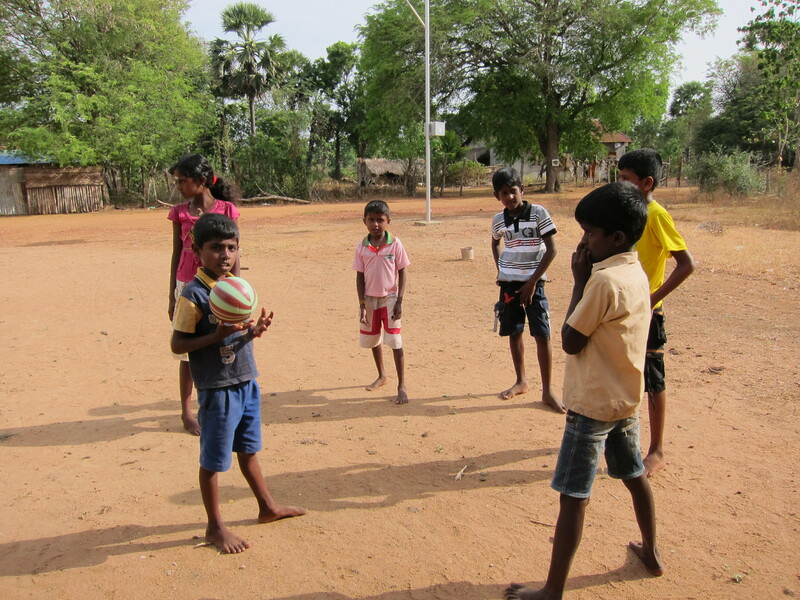 Since the kids at Kakkaiyankulam loved charades so much, I thought I’d do the same with these kids. So after a quick reminder about the different kinds of emotions we’d “discussed” the week before, I began to hand out pieces of paper so they could act out joy, sadness, anger, fear, surprise, and the like. After three kids had gone up, and proceeded to “act” out the emotions by putting on an inscrutably impassive face, I realised that what worked for Kakkaiyankulam wouldn’t necessarily work here. And thus began an incredibly long and painful hour on identifying emotions (joy, anger, fear, sadness, surprise – for now) recalling they felt these emotions. The children took what felt like years to think of times when they felt happy, angry and afraid, were completely stumped by sadness and surprise. Also, their range of experiences was extremely limited. They were angry when parents smacked them, happy when people gave them things (there wasn’t a single instance of happiness through giving or helping or their part, but maybe I’m just being finicky), and afraid of snakes and demons. After some prodding, Thushyanthan (the most promising child so far) offered that he was sad when someone took his puppy, but I literally had to feed them examples. Then we moved on to recalling what each incident felt like, and making the right kind of face. I’m sorry I have no pictures, but they did start making better faces. And then I started getting technical: What happens to your eyes? Your mouth? Your nose? Your eyebrows? I think it took about an hour to cover these four emotions, but I think we cleared the mists a little by the end of it. Apparently, according to Maheshwari, no one have ever taught them (or even her, she admitted) the mechanics of emotion. I really didn’t know what to say to that. I have no recollection of anyone teaching me those things, either. You just know, somehow, after a few years of living. Or so I thought. Maybe I’m being really subversive by telling them to think about their emotions. One unfortunate thing happened in all this emotion-ing, though. The kids can be really loud, and Maheshwari responds by yelling louder than them (even when I taught them the raise-your-hand-and-be-quiet technique, which they responded to). Two boys were being extra boisterous, and Maheshwari took it upon herself to discipline them by curtly telling them to sit on the side, whereupon one said angrily that he was leaving, and the other one sat on a side, refused to join in again, and left shortly thereafter. When I asked her about it, she said they’d be back, and I had nothing to be afraid of, which I thought was an odd response. These are some of the shortcomings of a translator who takes it upon herself to do more than just translate. I can also understand why she feels she’s going to need to board her children at school relatively soon. Okay, maybe I’m spoiled, but surely it must also be frustrating for children to have to deal with being cuffed and yelled at so often. The boys at Kakkaiyankulam are also often subjected to head-smacks by the male teachers – but respond well when I simply make funny faces at them and make a motion like I’m going to smack them (they know I’m not really going to do it). Interestingly enough, though, I’m fairly sure they listen simply because I’m a Stranger (you know, the kind of deference we all show to someone we don’t really know, who’s in a position of authority – otherwise it reflects badly on the family/school etc etc). Which is why I was also surprised at the quickness at which the two children at Chiraddikulam took offence when pulled up, and just left. And there really wasn’t even all that much awkwardness amongst the other kids following the dramatic exit of some of their number; they seemed to take it as a matter of course. Another moment of defiance was when I signalled to some boys who were hanging around at the back and being loud to be quiet, whereupon they went outside and deliberately made a ruckus. I decided to ignore them, and they soon tired of making a noise. So these kids are not used to displaying emotion, but they’re also not used to displaying politeness to people in authority? I admit, these little incidents puzzled me immensely, and I have to note that bad behaviour in Chiraddikulam has thus far been more deliberate and less a result of high spirits than at Kakkaiyankulam – maybe they’ll learn a few things from the Muslim kids. After all this soul-searching and emotion-identifying, we broke for biscuits. This time I had more than enough for everyone, including the onlookers over 11 who chose to watch instead of go home. We didn’t give out the extra milk to the onlookers, though (on Maheshwari’s suggestion, since apparently sharing is not a thing? More things they can learn from Kakkaiyankulam). The drive back was uneventful, and after dinner (puri and potatoes again) I slept. Fitfully. Perhaps I slept too much the night before. And then I woke up, as always, and I’m taking the train home now. Highlights from today’s ExpoRail ride include a documentary on the Wild Life of Brazil (no party animals involved, only nature’s creatures – what a disappointment that would be to someone with no interest in wildlife! Another one was a music video spoof on Dynamite: a bunch of Jewish boys singing, “I Throw My Latkes In The Air Sometimes.” I really do wonder where ExpoRail finds its entertainment. Enjoyed reading this post very much. Getting children to talk about their emotions can’t be an easy task!